Ali Reynolds doesn't go looking for trouble---but danger will show up on her doorstep in this latest adventure in the New York Times best-selling series. When Ali hires a contractor to help remodel her home, the last thing she expects is a suspected killer. But when the savagely murdered body of Morgan Forester is found by her twin daughters, Ali's contractor, Logan, is the primary suspect. Logan swears he has nothing to do with the killing--but no one, including Ali's dear friend, Detective Dave Holman, believes him. Can Ali help Logan prove his innocence? Will it cost her a dear friendship...or something even more precious than that? Like Kathy Reichs and Lisa Scottoline, J. A. Jance creates heart-pounding suspense, featuring a strong, sympathetic woman whose feet are planted firmly on the ground. Also like those authors, Jance delivers stories that appeal enormously to both male and female audiences of all ages. 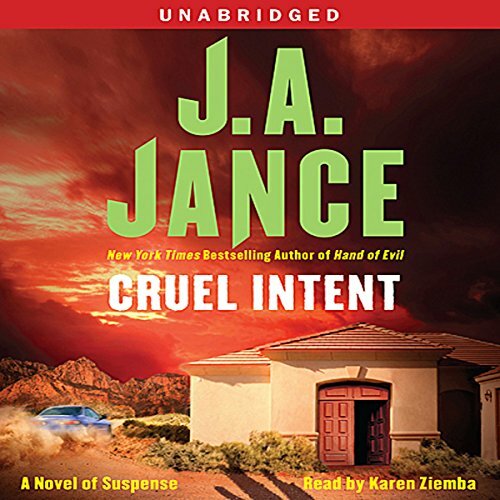 This was my first J.A Jance audio book and I have been to Sedona MANY times. I loved the way the author sets the scene it makes me feel like I'm back there again. The main character is identifiable to both women and men. She is strong, smart, funny and I really enjoyed listening. There is also a little forensics aspect added that makes the listener think hmmm. It's a well thought out plot with believable characters I would recomend this book to anyone. Another great Ali Reynolds book. More action and drama than some. I hope the next books in this series return to greater character and interpersonal development. Please give Ms. Reynolds more common and logical sense, please have her not always have to be stubborn to do things totally on her own and then wait for the last minute to ask for help.